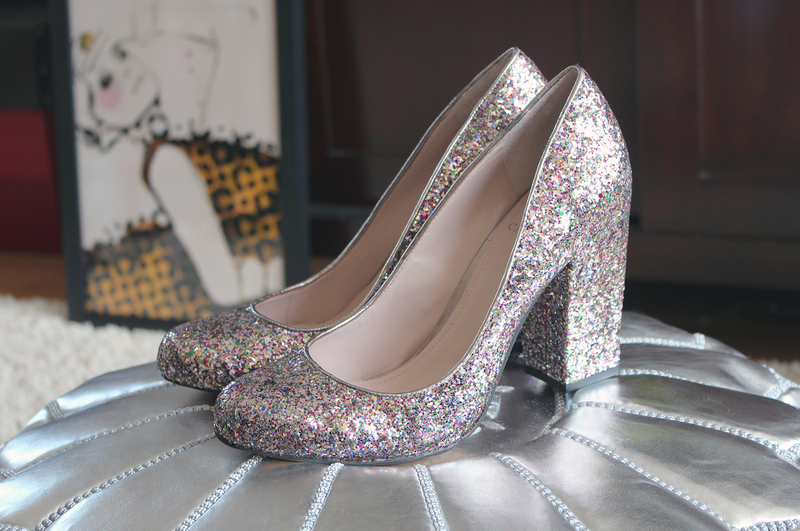 I picked up a pair of these sparkly Vince Camuto heels this past weekend for, get this–$7. Brand new and perfect for a Friday night happy hour. Can’t wait to take these out for a spin! I just recently got over a cold that just wouldn’t quit and I converted my Gigi New York python clutch into my “cold clutch” to toss into my bag to keep me going. 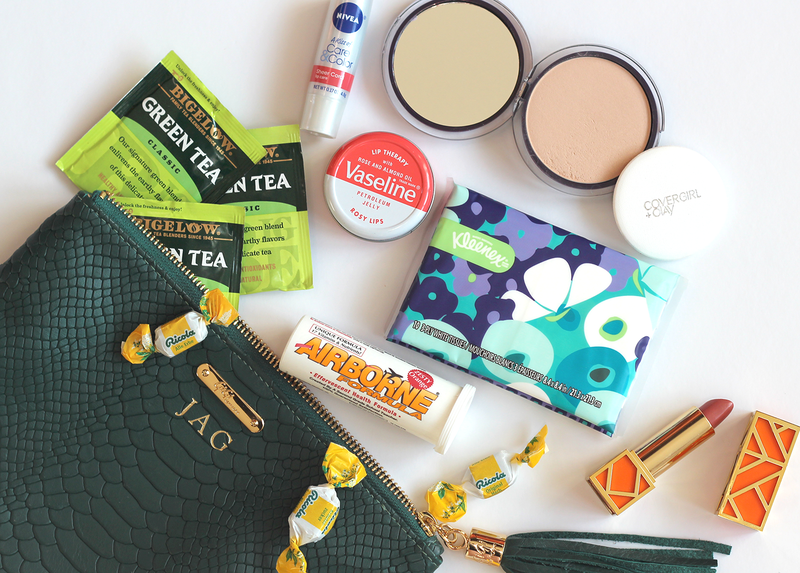 My cold clutch consisted of all of my essentials to keep my sniffles at bay and look somewhat decent. Kleenex Slim Pack Tissues – If I must be sick, at least my tissues can be designer…love this print designed by Isaac Mizrahi! Covergirl+OLAY – I keep this Covergirl+OLAY compact in my cold clutch for touch ups to remove redness from my nose. Its coverage is great camouflage for a cold! Nivea A Kiss of Care & Color – I just discovered this lip balm / lip color duo and really like the idea of moisture with a pop of color. Tory Burch Pas Du Tout Lipstick – You know that quote that says “put on some lipstick and pull yourself together”? Well, its true! 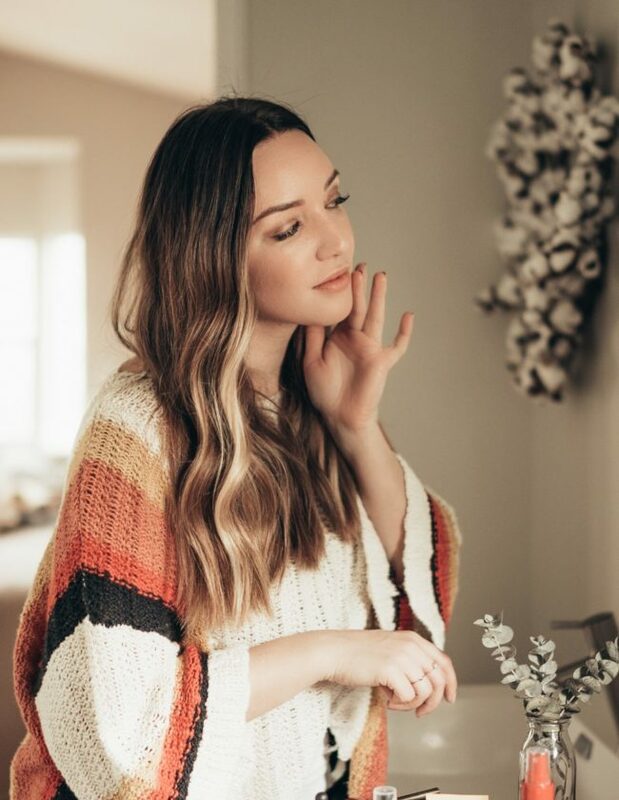 Sometimes you just need a lipstick pick-me-up and this Tory Burch hue is my current favorite! Gigi New York python clutch – You gotta have something cute to hold it all together! 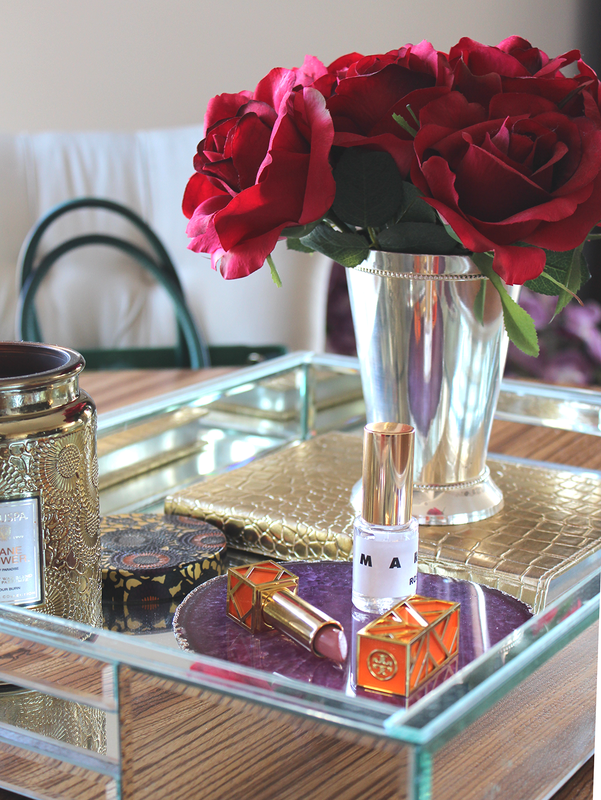 I’m always mixing up the styling of my coffee table tray and lately I’ve been using red roses, a Voluspa Crane Flower candle, purple agate coaster, and some spring beauty products–the aforementioned gorgeous Tory Burch lipstick that I can’t get enough of and a sample of the new Marni Rose fragrance which smells. so. good! Thank you to Kleenex for sponsoring this post, all opinions are my own. Thank you for supporting posts that keep Just Add Glam‘s doors open. Where in the world did you get those heels for such a steal? Love them! !